Located in Rock Hill, South Carolina, Christopher A. Wellborn, P.A., is the only law firm in the area that devotes 100% of its practice to criminal defense. No matter the nature of your criminal charge, including DUI, drug charges, robbery, child abuse, or juvenile delinquency, contact the firm for a free initial consultation. 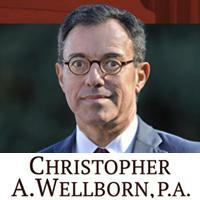 Attorney Christopher Wellborn, earned his law degree in 1988 from the University of San Diego School of Law after receiving a bachelor of arts from Bates College in Lewiston, Maine. A long-time resident of South Carolina, Wellborn is committed to serving the people of his area. Before opening his criminal defense law firm in 1997, Wellborn worked extensively in criminal law, including serving as prosecutor for York County. There, he prosecuted a whole range of crimes, from DUI to burglary to murder. This experience as a prosecutor gives him unusual insight into the criminal justice system, which he uses on behalf of criminal defendants. Twenty years after graduating from law school, Wellborn currently handles cases throughout South Carolina in state, federal, juvenile, and magistrate courts. He is the only attorney in the area, outside of public defenders, who devotes his entire practice to criminal defense. Wellborn is deeply rooted within the community he serves. He speaks frequently at seminars, discussing criminal defense topics. A founding member and former president of South Carolina Association of Criminal Defense Lawyers, he is well-known and respected by area judges, lawyers, court staff, police officials, counselors, therapists, and other professionals. He belongs to the York County Bar Association, the South Carolina Bar Association, and the National Association of Criminal Defense Lawyers.